Neither side are currently enjoying their finest days, but today marks a clash between two of football’s grand old clubs. Wrexham were formed in 1863, and Macclesfield Town in 1874, and for much of recent history, this fixture was a staple of the Football League calendar. That all changed in 2008, when Wrexham fell through the League Two trapdoor, with Macc following in 2012. The aim for both clubs is a playoff spot, and it’s today’s visitors who will be feeling more confident about meeting that target. Macc have faltered recently, with three league defeats preceding this crucial clash, whilst Wrexham – with 1,089 traveling fans in tow – arrive at the Moss Rose on a run of six matches unbeaten. Could Welsh dominance be the order of the day? I take the arduous 10 minute train journey into Macclesfield, and even under grey skies, the town retains a real charm. There are old cobbled streets, medieval churches and an abundance of charming little cafés. Originally a major player in the silk trade, Macc has more recently become renowned for the availability of some rather less wholesome substances. But on a Saturday afternoon, traversing the town centre’s cobbled steps, it’s undoubtedly scenic, pleasant and lively. 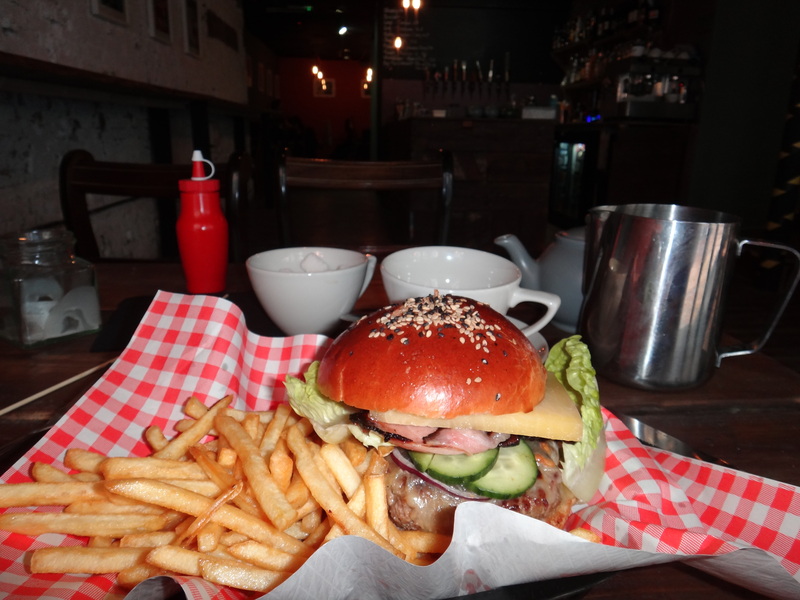 The great Irish playwright Brendan Behan claimed that “the most important things to do in the world are to get something to eat, something to drink and somebody to love you.” I set out to tick off the first two, starting at Volk Bar & Kitchen, a new Macclesfield eatery. Its walls are dotted with surrealist art, its menu with Americana eats (I opt for an excellent bacon cheeseburger with skinny fries) and the drinks offering is hip without being hipster. In short, I’m impressed. However, if you’re just after a light bite, the nearby Rustic Coffee Co. would be my recommendation. Macclesfield’s new eatery ‘Volk’ is well worth a visit. There’s time to nip into The Bate Hall, a traditional pub dating back to the 16th century, and most notable for its historic timbered interior. Its old world charm makes it a nice place to stop off for a quick drink – which I do – and its large windows offer a view out onto the historic Chestergate, if you fancy watching the world go by. 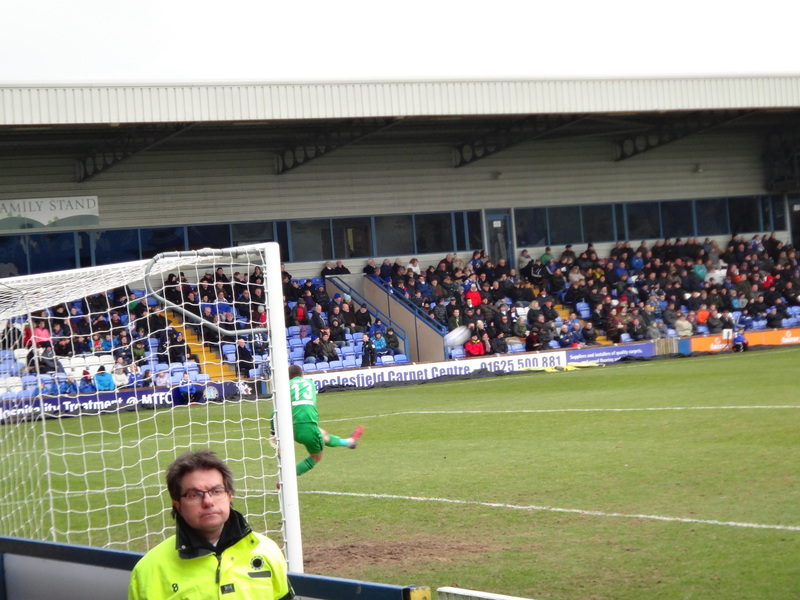 But I have somewhere to be, and off I head to the Moss Rose Ground, around 1.5 miles south of the town centre. 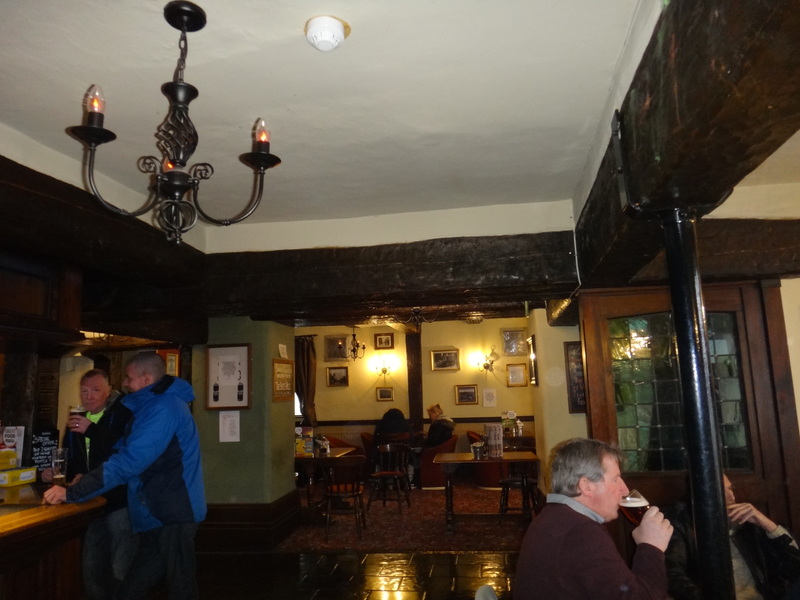 The historic interior of the Bate Hall Pub on quaint Chestergate. I arrive in time to enjoy the ground’s Corner Flag bar, which boasts an impressive selection of bottled beers, and an even larger collection of fans bemoaning Macclesfield Town’s recent form. I grab myself a Badger Hopping Hare ale and a match day program (well written) and chat with Allan, a lifelong Macc fan, to get the inside scoop on the team’s season. “We played quite well at the start of the season, and were well into the groove by the beginning of October”, he tells me. However, Allan contends that there’s now “no chance of a play-off spot”, and that whilst “Kristian Dennis is a top player”, he contends that “if [Dennis] doesn’t score, there isn’t much else”. As for Jack Sampson, I am informed that “he’s 6’9” and looks 5’9” in the air”. I thank Allan for his time, and head to my seat in the Brewtique Stand, having dialled down my expectations of the home team by several notches. Settling down in the Corner Flag bar with some essential matchday supplies. The Brewtique Stand consists of some modest terracing, with several rows of seats in front – none of it remotely protected from an icy Cheshire wind. Its smart but varied appearance is representative of Moss Rose. Behind the opposite goal is the uncovered John Askey Terrace, with the raised Silk FM Main Stand – built in 1968 – on one side of the pitch, and the smart, modern Henshaws Stand running alongside the other touchline. Wrexham’s large away following – and their flags – cover the chilly terrace and a corner of the Henshaws Stand, as we get underway. The early exchanges are a fairly tepid affair. Macclesfield’s Iraqi goalkeeper Shwan Jalal has one straightforward save to make in the early moments, but the game is short on goalmouth action. There is a strong wind howling across the Moss Rose, and both sides struggle to adapt their passing game, resulting in a series of throw-ins and groans from both sets of supporters. As the half wears on, Macc begin to exert themselves on the game. Danny Whitaker’s looping header lands on the roof of the net before Danny Whitehead lashes a shot just past the post. But the visitors come even closer, shortly before the half-hour mark, when Kayden Jackson rushes down the wing with the ball, and fires a lovely curling effort which beats the helpless Jalal. It crashes agonisingly off the post, though, and the Wrexham fans stand head-in-hands, as a grateful Macc defence clear the danger. Macc ‘keeper Shwan Jalal powers a goal-kick downfield. The intensity – and the quality of play – drops a bit as we near half-time, and those sauntering out of the Brewtique Stand for a cuppa before the whistle blows miss very little action. But the second period is quickly lit up by a slick Macc move which culminates in a goal bound strike from Kristian Dennis, and only the quick reactions of Wrexham ‘keeper Rhys Taylor – who spent three seasons with the Silkmen – prevent an opening goal. Wrexham’s first opening of the half is a dramatic and faintly ridiculous goalmouth scramble, which Macc just about survive. But again, this all-action burst quickly fizzles out into a game dominated by two well-organised defences and punctuated by a lack of cutting-edge in attack. It isn’t helped by some poor refereeing decisions, and whilst Macclesfield’s Chris Holroyd and Danny Whitehead continue to look lively, both struggle to provide Dennis with a gilt-edged chance. For their part, the Wrexham defence continues to outmuscle and outmanoeuvre the prolific Macc marksman. Both sides battle for possession in a tight affair. He’s marked closely throughout the game, and his final real chance of the match is effectively (and bravely) blocked by Wrexham’s imposing centre-back Blain Hudson. Both sides look for a winner, though neither take the risk of throwing men forward in big numbers. Chris Holroyd’s insouciant lob shaves the crossbar for the hosts before the tireless Kayden Johnson has a decent strike saved by the solid Jalal in stoppage time. For Wrexham, it’s a solid away point, and 0-0 is a fair reflection of the game. But the huge travelling support may well be thinking of Kayden Jackson’s strike against the woodwork and wondering what might have been. 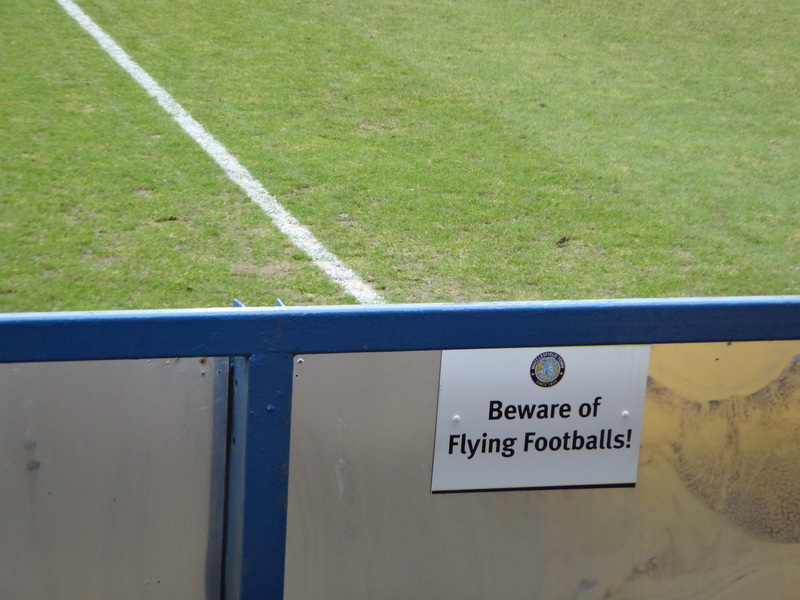 All visitors to the Moss Rose are advised to heed this warning! Ticket Prices: Prices vary as to whether tickets are bought in advance or on the day. Advanced ticket prices– Silk FM Main Stand & Henshaw’s Stand (Adults – £17 / Concessions – £13 / Under-12s – £2). Brewtique Stand & John Askey Terrace (Adults – £13 / Concessions £9 / Under-12s – £2). NB: It was £15 on the gate for entry to the Brewtique Stand. By Train: Macclesfield is well served by rail. The town’s station is on the London Euston-Manchester Piccadilly line, the Manchester Piccadilly-Oxford route, and the regional Manchester Piccadilly-Stoke on Trent service, all of which run frequently. 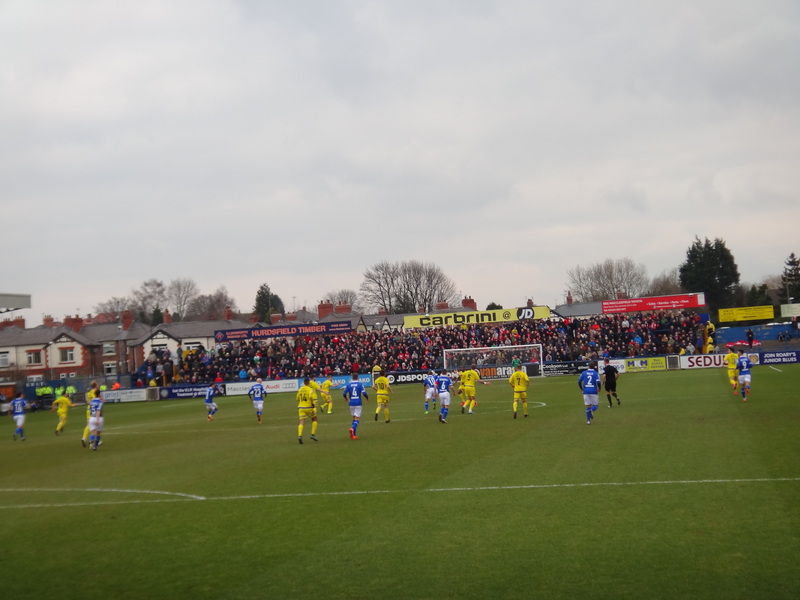 The Moss Rose Ground is around 1.5 miles south of the train station. By Car: If you’re coming from the South, leave the M6 at Junction 17 and go onto the A534 towards Congleton. Then follow signs for A54 Buxton, and remain on the A54 for 5 miles before taking the A523 towards Macclesfield. The ground will be on your left. 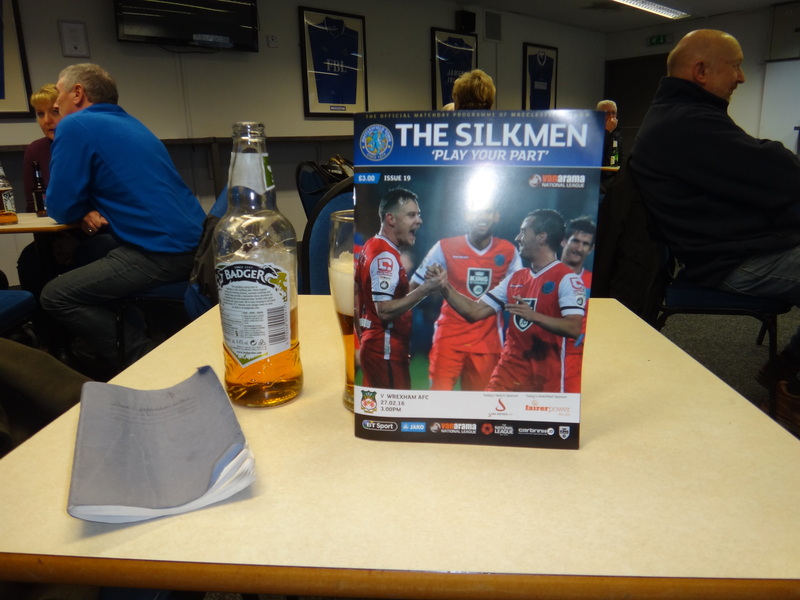 Posted on February 28, 2016, in Dave's Matchday Adventures, Macclesfield Town, UTL Archive, Vanarama National League, Wrexham FC and tagged Macclesfield, Macclesfield Town, Matchday, Moss Rose, National League, Wrexham AFC, Wrexham F.C.. Bookmark the permalink. Leave a comment.